08.06.18 01:08;Account;Receive;Received Payment 8.00 USD from account U18477573 to account U1294000. Batch: 217343749. Memo: API Payment. Withdraw to allhyips from Griffin Trader Limited. 09.06.18 12:11;Account;Receive;Received Payment 8.00 USD from account U18477573 to account U1294000. Batch: 217488754. Memo: API Payment. Withdraw to allhyips from Griffin Trader Limited. 11.06.18 05:20;Account;Receive;Received Payment 8.00 USD from account U18477573 to account U1294000. Batch: 217629239. Memo: API Payment. Withdraw to allhyips from Griffin Trader Limited. 13.06.18 10:56;Account;Receive;Received Payment 8.00 USD from account U18477573 to account U1294000. Batch: 217852615. Memo: API Payment. Withdraw to allhyips from Griffin Trader Limited. 15.06.18 06:27;Account;Receive;Received Payment 6.00 USD from account U18477573 to account U1294000. Batch: 218025379. Memo: API Payment. Withdraw to allhyips from Griffin Trader Limited. 14.06.18 10:12;Account;Receive;Received Payment 6.00 USD from account U18477573 to account U1294000. Batch: 217942817. Memo: API Payment. Withdraw to allhyips from Griffin Trader Limited. 17.06.18 23:43;Account;Receive;Received Payment 6.00 USD from account U18477573 to account U1294000. Batch: 218238756. Memo: API Payment. 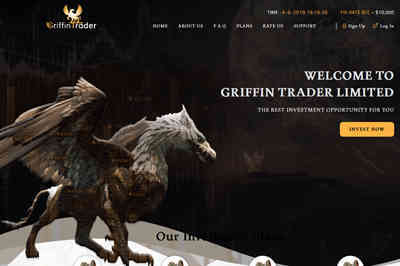 Withdraw to allhyips from Griffin Trader Limited.